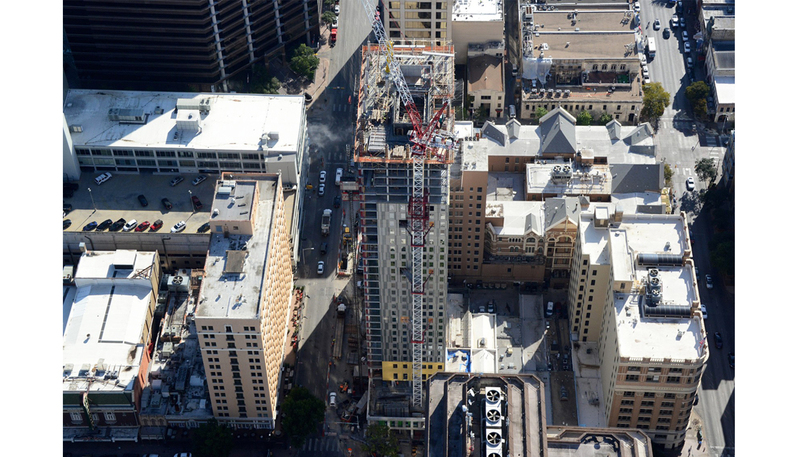 Building upon prefabrication strategies and lessons learned from the nearby dual-branded Aloft Austin Downtown and Element Austin Downtown hotels, White Lodging’s Marriott Downtown Austin, which broke ground in January, will take the creative use of prefabricated exterior skin panels to the next level. At the Marriott Downtown Austin, prefabricated skin panels will be built with gaskets added to the top and side edges of the panels to create the skin’s first layer of waterproofing and a temporary weather seal to protect the building upon installation. Scheduled to open in summer 2020, the Marriott Downtown Austin will complement the existing JW Marriott Austin to together provide more than 1,600 rooms and nearly 180,000 sq. ft. of meeting space within two blocks of the convention center. “The Aloft Austin Downtown and Element Austin Downtown hotels represent how the team creatively overcame the challenges of a tight, downtown jobsite to safely and efficiently deliver a first-of-its-kind dual-branded development for a repeat customer,” said Matt Murphy, who leads DPR’s commercial core market nationally. On a crowded block in the heart of downtown Austin and the city’s renowned 6th Street entertainment district, a 34-story tower is home to both the Aloft and Element hotels, which opened in summer 2017. Surrounded by a theater, adjacent historic hotel, restaurants and shops, the LEED-certified hotels are separate, but share amenities including a terrace, fitness center and meeting space. The 278-room Aloft is aimed at travelers in town for short trips, and the 144-suite Element caters to longer stays with kitchenettes and functional workspaces. On the hotel’s exterior skin, the hotels are differentiated by EIFS (Exterior Insulation and Finish Systems) plaster panels for Element, and gray metal panels for Aloft. At many downtown sites, below-grade parking provides much-needed laydown space for the team, but the Aloft and Element hotels do not have any parking onsite above or below ground, and are valet-only for customers. The team heavily scheduled deliveries, forcing themselves to be precise and not make exceptions, because they didn’t have a place to store materials. Closely collaborating with architect HKS and a Dallas-based prefabrication subcontractor, the team secured early and final design approval to prefabricate the hotel’s panelized skin offsite. In the safe and controlled environment of a warehouse, the team lost no days to weather conditions at the actual jobsite. The panels, built to very precise tolerances, included windows, which were set and sealed while rigged to a forklift. 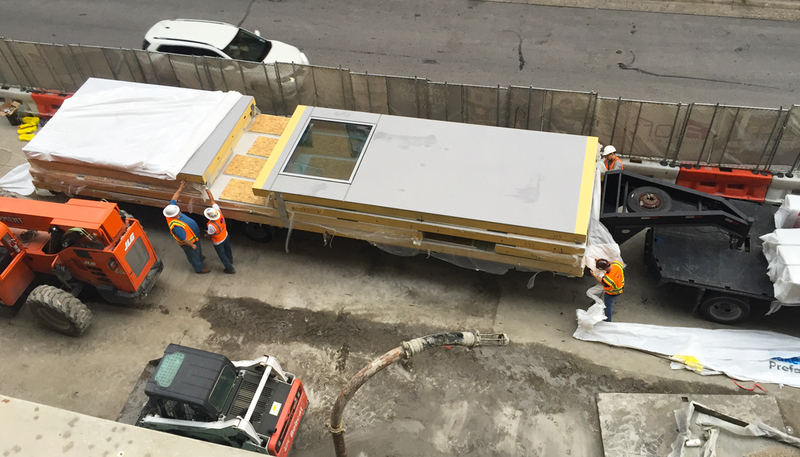 All water testing was also done offsite, enabling the panels to arrive at the jobsite in Austin ready to be installed, caulked at the perimeter joints and waterproofed by DPR’s self-perform work crews. 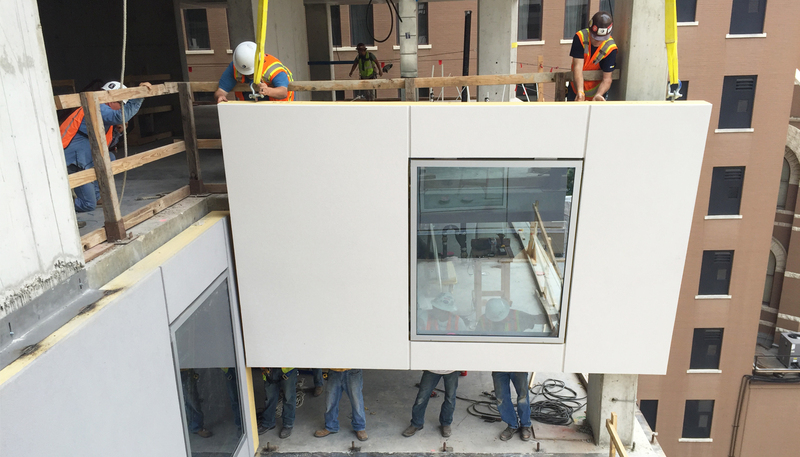 In a market where construction is booming and there is a high demand for labor, the prefabricated skin allowed the team to use smaller crews on-site, meaning less people on an already crowded downtown jobsite, and less people exposed to fall hazards by working on the leading edge of the building. 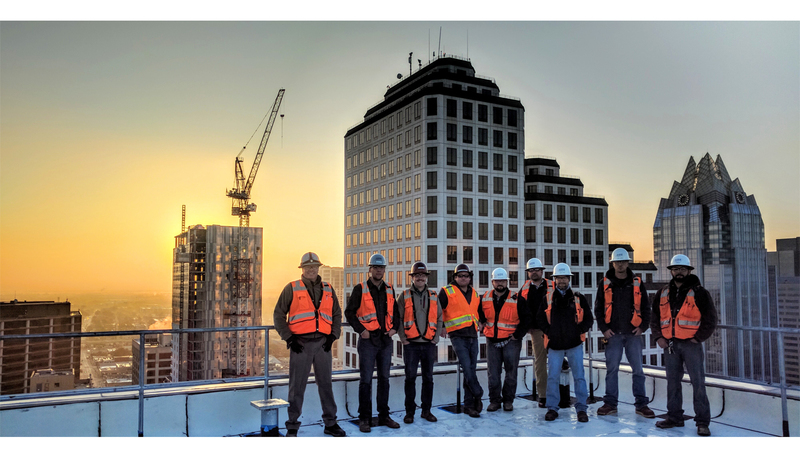 Safety risks were also mitigated by the fact that workers needed to go up and down the side of the 34-story tower less frequently than they would have if the panels were not completely prefabricated offsite. To install the skin with minimal impact and disruption to neighbors, work was done at night, with small crews installing an average of one floor a week. A traditional installation of one floor of skin typically takes three to four weeks of onsite work, which the team reduced to three nights of onsite install time. 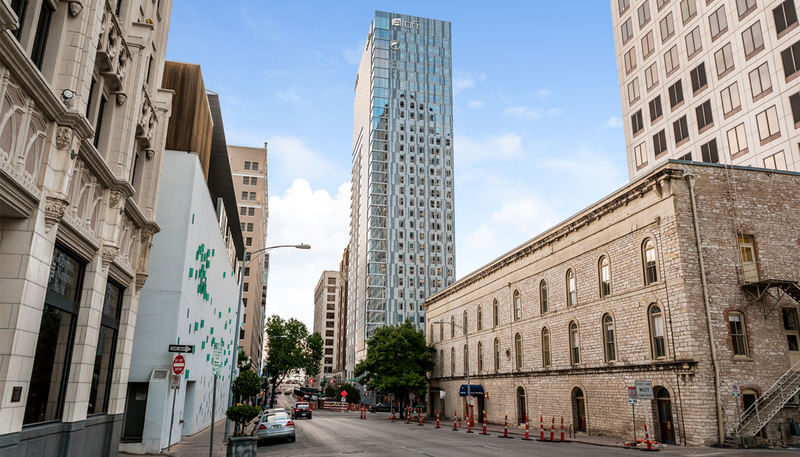 As it brings these creative prefabrication strategies to the Marriott Downtown Austin, not only will the DPR team continue to reshape Austin’s fast-changing skyline, but it will keep innovating and challenging itself to find ways to do it more efficiently.